It might only be MARCH, but it’s time for the MIX of the YEAR. SITE SANTA FE hosts in its cavernous and svelte Time Capsule Lounge. 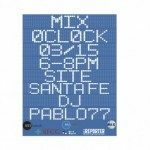 DJ PABLO 77 will span the decades–and probably a few millennia as well–in the service audio time travel and addictive aural undulations. Local craft distillers KGB SPIRITS will be on hand to offer FREE tastings of their incredible wares (including a sneak peak at Northern New Mexico Absinthe!) to anyone who completes a quick survey at the door or at MixSantaFe.com. ROUGE CAT will provide a cash bar for additional beverages, bets and boondoggles. Tasty, inventive food will be served, gratis, by the creative and dedicated students of the CULINARY ARTS PROGRAM at SFCC with help from local culinary hero Rocky Durham and program director and chef extraordinaire MICHELLE ROETZER! …You’ll be able to explore SITE Santa Fe’s TIME LAPSE exhibition, including a vintage microphone that talks back to you from the past, a movie that keeps playing but is never the same twice, and a massive fingerprint mash-up that will make you paranoid and giddy all at the same time. The space is amazing, the exhibition is incredible, the food and drinking wildly good and your presence will make it the place to be. As always, MIX is a private party and YOU are invited.